We all know that the Irish are very lucky people. No wonder why so many online casino developers have created betting machines based on these lucky folks. 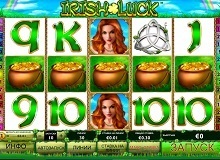 In this case, the Irish Luck casino slot online is one of the most popular video betting releases from Playtech. The game features a decent structure of five reels and a total of 30 paylines. The whole story behind the slot is based on the Emerald Isle, the place where all your wishes can come true. 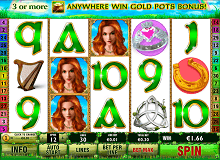 If you play the Irish Luck slot machine online, you will enjoy the bright colors and the entertaining visuals of this modern video machine. Once you open the home screen of the game, you will find a 5×3 board of reels hanging on golden ropes. The background of the game is a country field under a rainbow on a sunny sky. The entire game has a very relaxing vibe, which makes it so enjoyable. The entire gameplay is followed by a traditional Irish soundtrack that perfectly suits the theme. Before we discuss the features of the slot, take a look at the betting requirements below. Placing a bet on the Irish Luck casino slot online is quite simple. You need to enter the control panel located at the bottom of the screen. This is where you will find numerous settings and options, including the gamble mode, the bet max button, autoplay features, and the bet per line setting. What’s great about this betting machine is that it offers flexibility when it comes to the betting options. The coin sizes range from 0.01 to 5, whereas you can bet a maximum of ten coins per a payline. Once you’ve selected the desired amount to bet, hit spin and watch as the matching symbols align from left to right. If they align on an active payline, you will be taking home some great cash rewards. The basic objective of this betting game is to match identical symbols from left to right. However, the fun goes far beyond matching symbols. In fact, the Irish Luck casino slot online brings one of the best rewards you will find in online casinos – a jackpot worth 10 000 coins. In order to become a lucky winner of the enormous jackpot, you have to collect a total of five wild symbols in one spin. 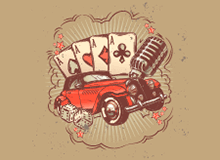 The wild is represented by the Celtic redhead and it brings the highest payouts in the game. Besides forming its own wins, the wild symbol multiplies your winnings when it appears in any symbol combination. The golden horseshoe and the love heart ring symbols are the second best when it comes to high payouts, as they reward the player with 750 coins for a combination of all five icons. The scatter symbol of the game is the pot of gold. Landing five scatters will get you a prize of 500 coins and trigger the Irish Luck free spins bonus where you can win up to 33 free rounds. The game can be triggered with as little as three scatter icons in one spin. Once the feature gets activated, you will receive eight free spins and a 2x multiplier. You can win more free spins along the way if you choose the right pots. Besides the free spins feature, players can take part in the gamble game where they need to guess the color of a card flipped upside down. Guessing correctly will double the player’s winnings, whereas guessing incorrectly will cause them to lose everything they won in the previous spin. If you’re wondering whether you should play Irish Luck for real money, we definitely recommend you to give it a shot. Besides the interesting features and the rewarding free spins mode, this casino online machine offers great quality graphics matched with a traditional Irish soundtrack that allows the players to fully enjoy the Irish Luck experience. The betting flexibility of this machine makes the slot suitable for both high rollers and small stake players, as well as players of all skill levels. 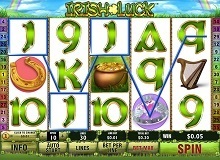 In other words, the Irish Luck slot is a great option for anyone who wants to try their luck out at one of the most traditional slot machines in the industry. Don’t forget that you can even win a jackpot that is worth a total of 10 000 coins and considered one of the best casino online slot jackpots!